Lock in a great price for Courtyard by Marriott Fishermans Wharf – rated 8.7 by recent guests! Great location, walk everywhere. Hotel was very quiet despite being in a central area. Room was clean and what you would expect. Very nice helpful staff. The breakfast in the hotel was great. Room was very comfortable. First day (2-15-2019) we arrived at 11-1130p, David attendant did not give me the correct information about your vallet parking policy. Vallet parking attendant that night was not friendly. I forgot his name but he is a Filipino guy. He literally ask my wife to walk 2 blocks away from your property when my wife ask him that she needs something in our car. My wife answer him abruptly saying we paid for vallet parking why should i walk? The staff in the restaurant was the friendliest I have ever experience at a Marriott. How nice to get great service with a smile. How sad to think, it’s rare. 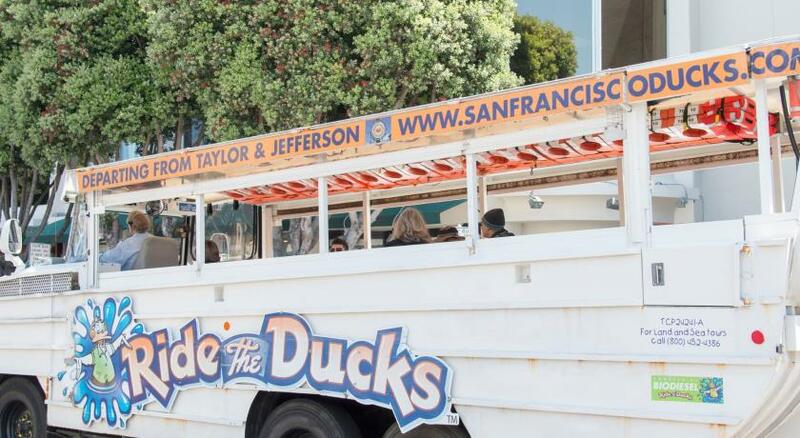 Very conveniently located in the Fisherman's Wharf area of San Francisco, so we could walk to parks, shops, restaurants, etc. 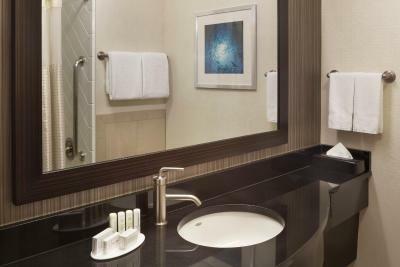 We often choose Courtyard properties: the beds are comfortable, the rooms spacious and smartly-designed (e.g., USB ports on bedside tables), and the bathrooms have ample counter space. We stayed just one night at this hotel, but did not notice a lot of street noise. We did not visit the on-site restaurant, and the staff provided printed lists and details about nearby restaurants. Great location and good value. Easy walk to cable cars and Fisherman's Wharf. Beds are nice .. Location is perfect .. Valet is good! Location was perfect. Staff very helpful and friendly. 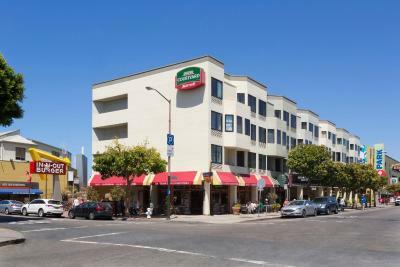 Courtyard by Marriott Fishermans Wharf This rating is a reflection of how the property compares to the industry standard when it comes to price, facilities and services available. It's based on a self-evaluation by the property. Use this rating to help choose your stay! 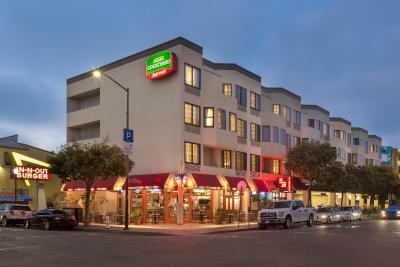 This San Francisco hotel is 4 miles from the Golden Gate Bridge and within a 5-minute walk of Fisherman’s Wharf. 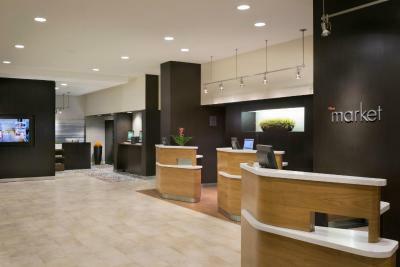 The hotel offers concierge service and rooms with refrigerators. 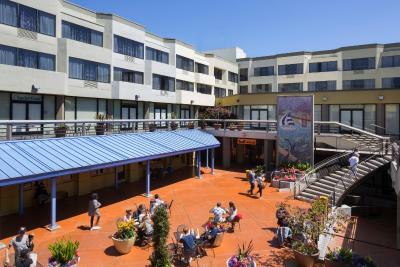 Courtyard Fisherman’s Wharf rooms include a coffee maker and seating area. 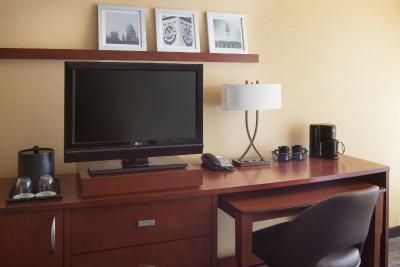 The rooms are equipped with wired internet access and pay-per-view movies. 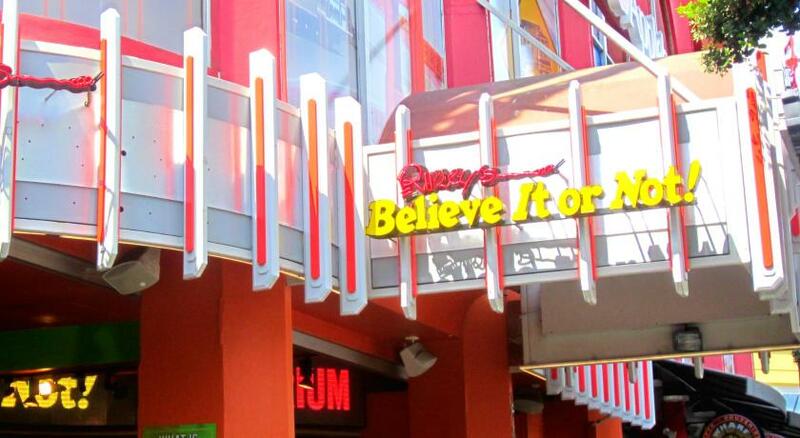 Guests at the Courtyard can dine at the Bistro for breakfast or grab a snack from the 24-hour snack shop. 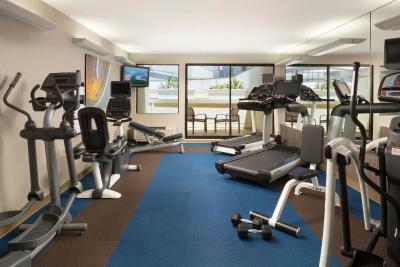 The Fisherman’s Wharf Courtyard guests can work out in the gym or work in the business center, which features boarding pass printing. The Courtyard is within a 5 minute walk of the Hyde Street Cable Car. 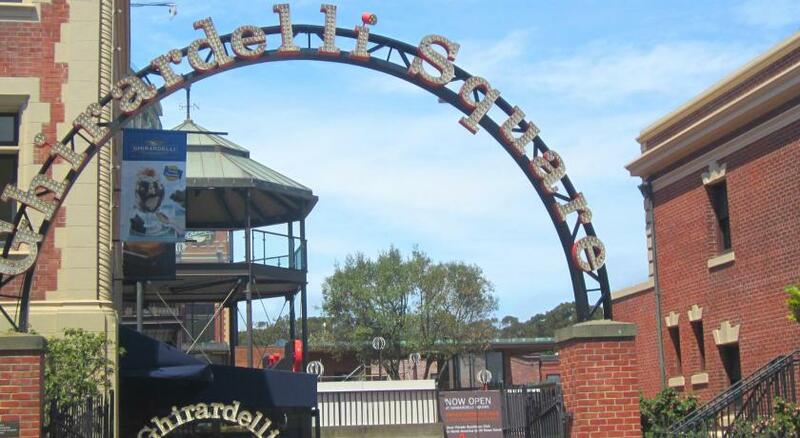 The hotel is within a 10-minute walk of Pier 39, which offers shopping and dining. 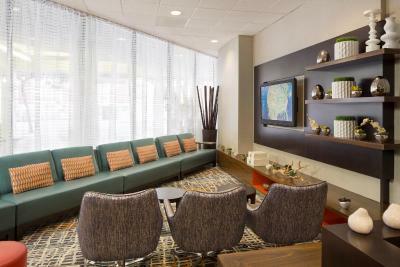 When would you like to stay at Courtyard by Marriott Fishermans Wharf? 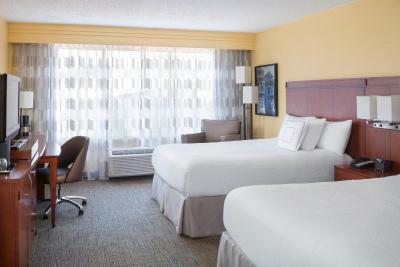 Featuring free Wi-Fi and cable TV, this room comes with tea and coffee-making facilities and a fridge. Private parking is available at a location nearby (reservation is not needed) and costs USD 43.32 per day. This double room has air conditioning and cable TV. 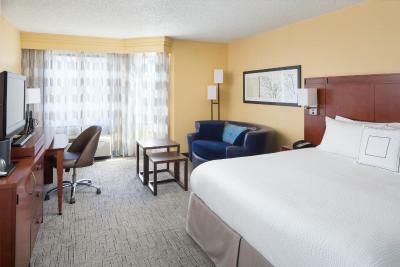 Courtyard by Marriott, Fisherman's Wharf San Francisco, California is located within the Anchorage Shopping Center and has convenient Valet service and entrance on Beach Street. 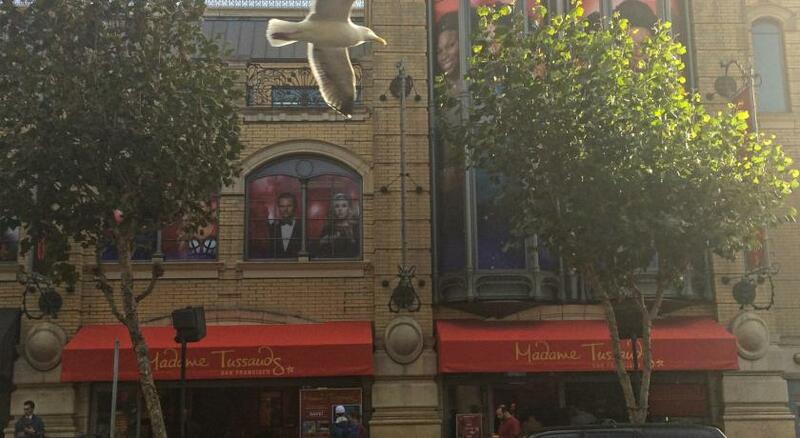 The hotel is located in the heart of Fisherman's Wharf. 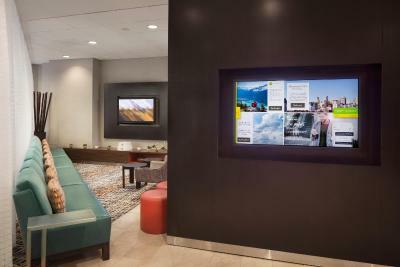 House Rules Courtyard by Marriott Fishermans Wharf takes special requests – add in the next step! Courtyard by Marriott Fishermans Wharf accepts these cards and reserves the right to temporarily hold an amount prior to arrival. We stayed a Friday night. the drag strip and police chase in the street kept me awake. Close to Fisherman's Wharf. The staff were very welcoming, helpful and friendly. One of the nights had a very high price, which make the entire stay not as cost attractive. The breakfast poor and expencive. Location to the Waterfront was excellent. Close to all major attractions or public transport to get you to the others. Staff exceptionally helpful. Big clean rooms. Breakfast hours a little too short for holiday visitors. The view into the carpark directly opposite the room a catch for the unwary. 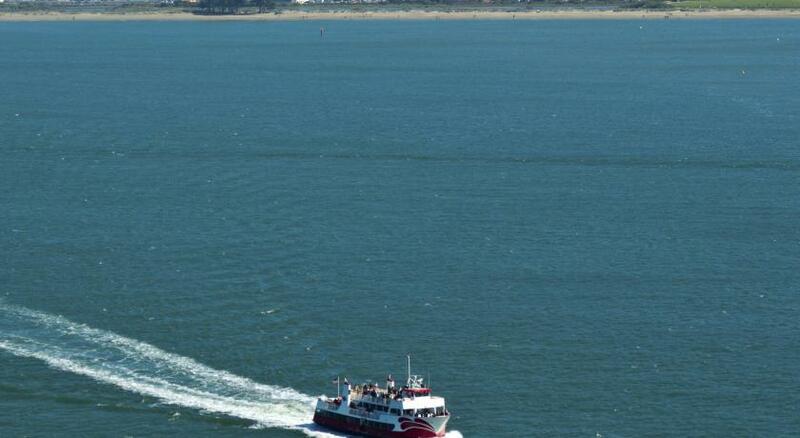 Very close to Wharf complex and short walk to dining precinct on Colombus. Seemed to be in a safe and well populated area for families. The people were very helpful and friendly.